Keep Hair Looking It's Best! Goldwell are committed to hair perfection, whether it’s in the form of shampooing or styling. With a contemporary new design, each Goldwell product is created with stunning salon-quality results in mind, helping to maintain your hair’s health and allowing it to look its absolute best. Not only stylised with a sleek new packaging design, the innovative collections from Goldwell are complete with upgraded technology and improved formulas too, and we’ve brought some of our favourites together in some gorgeous bundles, just for you. As most of our Goldwell customers buy more than one product at a time, we’ve packaged some of our favourites together for the best possible value. Our Goldwell Packs have been put together to ensure you get exactly what you need for your haircare requirements at the best possible price. For example, if you’re off to warmer climes and scared of a hair-mare in the heat, the Goldwell Dual Senses Just Smooth Taming Shampoo, Conditioner and 60 Second Treatment Pack will ensure your super smooth and straight style stays sleek in the sunshine. 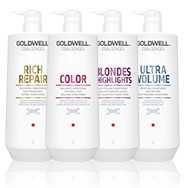 Equally, if you’re after a solution to brassiness in your blonde, the Goldwell Dual Senses Blonde & Highlights Anti-Yellow Shampoo, Conditioner and 60 Second Treatment Pack will keep your blonde looking salon-fresh, vivid and vibrant from one wash to the next. Enabling you to become a true styling expert with ease, Goldwell have also created the GOLDWELL EDUCATION PLUS App, downloadable in the App Store and Google Play Store, which is full of looks and techniques to inspire your haircare and styling regime. So whether you’re seeking salon-quality shine, some va-va-voom volume to liven up your locks, or simply something to tame troublesome tresses, there’s a Goldwell Pack to tick every box in our carefully curated collections. So go ahead, get Gorgeous with Goldwell! Whether you’re tired of timid tones, bored of brassiness, or done with dullness after your last dye, Goldwell are here to offer you a solution to your coloured hair needs with the innovative Goldwell Color Collection. Committed to hair perfection, whether it’s in the form of shampooing or styling, Goldwell create products with stunning salon-quality results in mind, helping to maintain your hair’s health and allowing it to look at its absolute best. Not only stylised with a sleek new packaging design, the innovative Color range from Goldwell is complete with upgraded technology and improved formulas too. With Goldwell Global Master, Lisa Whiteman, stating that nothing inspires her more than colour, it’s clear that you’re in safe hands with Goldwell Color. Adding luminosity to lacklustre locks, the Color Brilliance range features the unique FadeStopFormula, working to minimise colour fading with every use. Goldwell’s unique Luminescine technology transforms non-visible UV light into visible light for stunning shine and ‘wow’ colour and luminosity. With the range used by certified haircare professionals in-salon, as well as at home, you can rest assured your colour-treated hair will look salon-fresh, vivid and vibrant from one wash to the next with Goldwell Color. With the new 60 Second Treatment regenerating hair in one minute, by boosting natural colour and providing nourishing care, even those who struggle for time when it comes to their haircare regime need look no further than Goldwell. So don’t panic if you need to leave it a little longer between salon visits, thanks to Goldwell Color you can keep your colour fresh and vibrant from one appointment to the next with ease. If you’re looking for a little more styling inspiration, Goldwell have also created the GOLDWELL EDUCATION PLUS App, downloadable in the App Store and Google Play Store, which is full of looks and techniques to inspire your haircare and styling regime. Whether you’re tired of timid tones, bored of brassiness, or done with dullness after your last dye, Goldwell are here to offer you a solution to your coloured hair needs with the innovative Goldwell Color Extra Rich Collection. Not only stylised with a sleek new packaging design, the innovative Color Extra Rich range from Goldwell is complete with upgraded technology and improved formulas too. With Goldwell Global Master, Lisa Whiteman, stating that nothing inspires her more than colour, it’s clear that you’re shade is in safe hands with Goldwell. Adding luminosity to lacklustre locks, the Color Extra Rich range features the unique FadeStopFormula, working to minimise colour fading with every use. Goldwell’s unique Luminescine technology transforms non-visible UV light into visible light for stunning shine and ‘wow’ colour and luminosity. With the range used by certified haircare professionals in-salon, as well as at home, you can rest assured your colour-treated hair will look salon-fresh, vivid and vibrant from one wash to the next with Goldwell Color Extra Rich. So don’t panic if you need to leave it a little longer between salon visits, thanks to Goldwell Color Extra Rich you can keep your colour fresh and vibrant from one appointment to the next with ease. No one likes brassiness in their blonde, and with platinum being the shade of the moment, Goldwell are here to offer you a solution to dull dye jobs and flat colour. The Blonde & Highlights collection from haircare experts, Goldwell, works to neutralise yellow tones and banish brassiness, boosting colour luminosity and shine. With Goldwell Global Master, Lisa Whiteman, stating that nothing inspires her more than colour, it’s clear that you’re suited shade of blonde is in safe hands with Goldwell. The unique FadeStopFormula in the Anti-Yellow collection works to minimise colour fading with every use, while Goldwell’s unique Luminescine technology transforms non-visible UV light into visible light for stunning shine and ‘wow’ colour and luminosity. With the range used by certified haircare professionals in-salon, as well as at home, you can rest assured your colour-treated hair will look salon-fresh, vivid and vibrant from one wash to the next with Goldwell Blondes & Highlights. With the new 60 Second Treatment regenerating hair in one minute, by neutralising undesirable yellow tones to ensure bright blonde shine, even those who struggle for time when it comes to their haircare regime need look no further than Goldwell! So don’t panic if you need to leave it a little longer between salon visits, thanks to Goldwell Blonde & Highlights you can keep your blonde beautiful and vibrant from one appointment to the next with ease. Grey hair is no longer something to be hidden away or banished to the days of the blue rinse. From granny cool, to the catwalks of Fashion Week and the hair of red carpet royalty, silver is no longer second best. 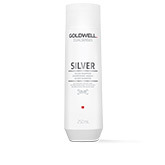 Here to help you make the most of your inner silver siren and to ensure you’re the head of the silver fox pack, Goldwell’s Silver collection works to neutralise yellow tones and banish brassiness, instantly refining grey and cool blonde hair. With Goldwell Global Master, Lisa Whiteman, stating that nothing inspires her more than colour, it’s clear that you’re sought-after shade of silver is in safe hands with Goldwell Silver. The unique FadeStopFormula in the Silver collection works to minimise colour fading with every use, while Goldwell’s unique Luminescine technology transforms non-visible UV light into visible light for stunning shine and ‘wow’ colour and luminosity. With the range used by certified haircare professionals in-salon, as well as at home, you can rest assured your colour-treated hair will look salon-fresh, vivid and vibrant from one wash to the next with Goldwell Silver. So don’t panic if you need to leave it a little longer between salon visits, thanks to Goldwell Silver you can keep your platinum blonde beautiful and your silver stylish and vibrant from one appointment to the next with ease. Come rain or shine, colour or curling, our hair can be easily damaged by environmental stressors, which is why Goldwell are here to offer a solution to help you reawaken the shine of dry and damaged hair. 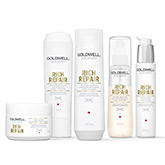 The innovative Rich Repair range from Goldwell is complete with IntraLipid Complex, to repair hair from the inside. Repairing the damaged lipid structure of the hair surface, and replacing lipids deeply and effectively from within the hair, the range instantly restores even severely damaged hair structures. With the range used by certified haircare professionals in-salon, as well as at home, you can rest assured that dull and dry hair will be delivered a much-needed boost of shine and structural reinforcement with the Rich Repair range. With the 6 Effects Serum working to regenerate hair with anti-breakage, silky suppleness, enhanced elasticity, healthy looking mid-lengths and ends, instant shine and reinforced hair structure, there’s something for even severely damaged hair in the Rich Repair collection. The unique FadeStopFormula in the Restoring Shampoo also works to minimise colour fading with every use, for stunning shine and ‘wow’ colour and luminosity. So don’t panic if your hair is going through a dry spell, or your ends are looking a little worse for wear, thanks to Goldwell Rich Repair you can enhance the natural beauty of your hair for a salon-worthy finish. New from salon experts, Goldwell, the Just Smooth collection has been created to answer the prayers of those struggling to maintain frizzy hair. The innovative Just Smooth range, with built-in colour protection, has been formulated with nourishing Kukui nut oil to moisturise hair. Evening the hair surface and smoothing the hair structure, Kukui nut oil works to detangle hair and control frizz, for a manageable finish. With the range used by certified haircare professionals in-salon, as well as at home, you can rest assured that frizzy and unmanageable hair will be tamed with ease with Goldwell’s Just Smooth range. With the collection including the must-have Just Smooth Taming Oil, complete with anti-humidity effect, and the Just Smooth 60 Second Treatment, which works to regenerate hair instantly, even those with little time to spare on their hair can achieve manageable tresses. For those off to warmer climes, the 6 Effects Serum is perfect for tackling humidity-induced frizz. Instantly providing 6 smoothening effects, including natural shine and humidity control, it’s a must-have to pop in your suitcase. So don’t panic if you need to fight the frizz, or if your mane feels unmanageable, thanks to Goldwell Just Smooth you can tame, smoothen and control frizz in seconds for a salon-worthy finish. So wave farewell to frizz, banish bad hair days and welcome a little wellness into your haircare routine, you’ll thank us for it, and that’s a Gorgeous promise! Add a little va-va-voom into your haircare routine with Ultra Volume from Goldwell. Designed to strengthen hair from root to tip, and enhancing fullness without heaviness, the Ultra Volume range is a must-have for those with fine to limp hair. The innovative Ultra Volume range is formulated with rice protein, utilised for its strengthening properties, providing visible and touchable volume for thin and lacklustre locks. With the range used by certified haircare professionals in-salon, as well as at home, you can rest assured that limp and fine hair will be given a much-needed boost with Goldwell’s Ultra Volume range. With the range including the Bodifying Dry Shampoo, perfect for refreshing and reviving volume between washes, and the Bodifying Spray which supports fullness with lightweight care while detangling and strengthening the hair, even those with little time to spare on their hair can achieve manageable tresses. For the ultimate boost, why not try the Ultra Volume Bodifying Shampoo, Conditioner and Bodifying Spray pack? As well as working to build volume, the Bodifying Shampoo is even formulated with the unique FadeStopFormula to minimise colour fading with every use! So next time you’re having a drab hair day, and feeling a little flat, don’t panic. Thanks to Goldwell Ultra Volume you can boost your bravado and heighten your hair with ease for a salon-worthy finish. The Curly Twist range has been specifically formulated to hydrate and define wavy, curly and permed hair, providing weightless bounce and elasticity. With built-in colour protection, the hydrating collection has been designed to revive limp and lacklustre curls, delivering a boost of buoyancy and definition. With the range used by certified haircare professionals in-salon, as well as at home, you can rest assured that your waves and curls will be given a much-needed hit of hydration with Goldwell’s Curly Twist range. Formulated with milk protein, which works to improve elasticity and bounce for hydrated and reactivated curls, the Curly Twist range includes a product for every occasion. The Curly Twist Hydrating Shampoo is formulated with the unique FadeStopFormula to minimise colour fading with every use, while the New Hydrating Condition instantly hydrates and defines while detangling and providing elasticity, making them the perfect pair for your haircare needs. With the range including the Curly Twist Hydrating Serum Spray, controlling frizz instantly by strengthening and moisturising the hair fibre, you can even keep your curls under control on the go by simply slipping the spray in your handbag. So next time you’re having a drab hair day, lacking bounce and buoyancy, don’t panic. Thanks to Goldwell Curly Twist you can curate your curls to showcase your natural beauty, and hydrate your hair with ease for a salon-worthy finish. Understanding that good hair is nothing without a good scalp, Goldwell’s Scalp range has been formulated to target varying scalp problems, including solutions to hereditary hair loss, a sensitive scalp and thinning hair. The Anti-Dandruff Shampoo works to instantly and effectively fight against visible dandruff with regular use, while the Deep Cleansing Shampoo regulates the production of sebum and supports hair anchorage, helping to strengthen and stimulate the hair. The Sensitive range is also ideal for those with easily-irritated scalps, as it’s free from fragrances and works to soothe and condition sensitive scalps. 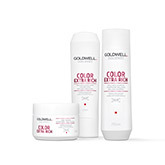 Goldwell have also crafted a collection of products to effectively prevent hereditary hair loss. The Anti-Hair Loss Serum works to thicken the hair fibre, supporting the anchoring of the hair in the scalp and works best when combined with the Anti-Hair Loss Spray. Formulated with t-Flavanone, which helps to stimulate and strengthen the hair, the Anti-Hair Loss products balance the scalp and offer a solution to the often-concerning issue of hereditary hair loss. With the solutions crafted by haircare professionals, you can rest assured that your hair and scalp will be left balanced and beautiful with Goldwell’s Scalp range. So next time you’re scalp’s feely irritated, flaky or unclean, don’t panic. Thanks to Goldwell Scalp you can soothe and cleanse your issues away, for a salon-worthy finish and a clean and fresh feeling. Understanding that it’s not just the ladies who want to maintain their mane, Goldwell have carefully curated their Men collection to cater to all men’s hair needs. Designed to strengthen hair, delivering a dose of energy and health, Goldwell’s Men collection is enriched with guarana and caffeine, working together to provide healthy looking, strong hair with noticeably more energy. With built-in colour protection, Goldwell’s Men range has been formulated to cater to all men’s haircare requirements. Including Anti-Dandruff Shampoo to instantly fight dandruff and cleanse the hair and scalp effectively, Activating Scalp Tonic to refresh and revitalise the scalp for a stimulating and cooling effect and Thickening Shampoo to give hair a boost for strong hair from the roots, there’s an array of products to kick start his haircare routine. With styling solutions in the range including Power Gel with an alcohol-free formula and strong hold with lasting control, Texture Cream Paste to style flexibly with a matte finish and naturally structured looks and Dry Styling Wax to accentuate and define, from shower to showroom his haircare is sorted! 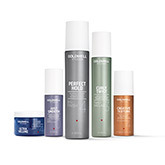 Whether he’s seeking a solution to boost body and heighten hair health, or after a shampoo to cleanse and rebalance his scalp, with the collection crafted by haircare professionals Goldwell, he can rest assured that his hair and scalp will be left balanced and refreshed with Goldwell’s Men range. With an optimised and self-explanatory assortment of products, Goldwell Style Sign, complete with a new design, upgraded technology and improved formulas, features a solution for every styling need. From Just Smooth Diamond Gloss which works to effectively block humidity for up to 72 hours while maintaining a glossy finish, to Ultra Volume Power Whip Strengthening Mousse which improves grip while offering long-lasting volume and strong hold, Goldwell Style Sign truly caters to every hair requirement and ensures the styling power is in your hands. Complete with flexPROtec complex, styling polymers and bamboo proteins work together to ensure natural and flexible style, while enabling the ability to create any look. With UV filter in all products, and a new elastomer, hair is protected from premature colour fade, as well as the damaging effects of UV-light and heat styling. These amazing product innovations and improved formulas ensure that hair is left visibly smoothened and shiny, with a gorgeous scent thanks to modern fragrances. Ultra Volume - A boost of volume with strong, yet flexible hold. Just Smooth - A helping hand for silky, smooth and straight style. Curly Twist - Defining style for curls and waves. Creative Texture - Textured looks and styles to unleash your creativity. Perfect Hold - Humidity protection with long-lasting and flexible hold. Goldwell are committed to hair perfection, whether it’s in the form of shampooing or styling. 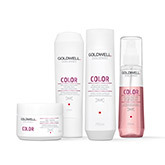 With a contemporary new design, each Goldwell product range features a specially-formulated shampoo, conditioner, leave-in masque and/or styling product that helps to maintain your hair's health and allowing it to look its absolute best. Created with stunning salon-quality results in mind; the innovative collections from Goldwell not only come stylised with a sleek new packaging design, but complete with upgraded technology and improved formulas too. From the Curly Twist range, perfect for enhancing and defining wayward curls for stunning results, to the Ultra Volume collection designed to revive thin and lacklustre locks; whether you’re looking to tame the frizz or boost the volume, there’s something for every haircare need in this eclectic and inclusive wonder range from the expert hair masters at Goldwell. Goldwell even has holiday humidity covered; with the Just Smooth range there’s no need to despair if you’re off to warmer climes and scared of a hair-mare in the heat. On hand to ensure your super smooth and straight style stays sleek in the sunshine, this shine-boosting collection will be your new go-to for tackling fuzzy frizz. From the Just Smooth Taming Oil, providing manageability and adding stunning shine, to the Just Smooth Taming Shampoo and Conditioner Duo, which combine to even the hair surface and structure, Goldwell have silky-straight style sorted. 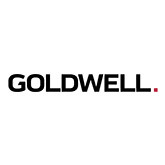 Goldwell doesn’t just stop at styling solutions. Colour treated hair will find a friend in Goldwell too. With the Blonde & Highlights collection, working to remove brassy tones from blonde or highlighted hair, and the Color Brilliance collection keeping salon colour vivid and vibrant from one wash to the next, you’ll soon wonder how you ever went without Goldwell guiding your haircare routine. With Goldwell hair products, including Goldwell shampoo and Goldwell treatments, your hair will be in perfect condition.